For the character this series is based on, see Static (DC Comics). For shocks from static electricity, see Electrostatics and Triboelectric effect. Static Shock is an American animated television series based on the Milestone Media/DC Comics superhero Static. It premiered on September 23, 2000, on The WB Television Network's Kids' WB programming block. Static Shock ran for four seasons, with 52 half-hour episodes in total. The show revolves around Virgil Hawkins, an African-American boy, who uses the secret identity of 'Static' after exposure to a mutagen gas during a gang fight which gave him electromagnetic powers. Part of the DC animated universe, the series was produced by Warner Bros. Animation from a crew composed mostly of people from the company's past shows, but also with the involvement of two of the comic's creators, Dwayne McDuffie and Denys Cowan. Static Shock had some alterations from the original comic book because it was oriented to a pre-teen audience. Nevertheless, the show approached several social issues, which was positively received by most television critics. Static Shock was nominated for numerous awards, including the Daytime Emmy. Some criticism was directed towards its jokes—which were said to be stale and too similar to Spider-Man style—and animation, which was said to be unnatural and outdated. The series also produced some related merchandise, which sold poorly; McDuffie cited the low sales as one of the main factors behind the series' cancellation. In spite of this, its popularity revived interest in the original Milestone comic and introduced McDuffie to the animation industry, and it maintains a dedicated fanbase to this day. Virgil Hawkins is a fourteen-year-old who lives with his older sister Sharon, and his widowed father Robert in Dakota City. He attends high school with his best friend Richie Foley, and has a crush on a girl named Frieda. He also has a dispute with a bully named Francis, nicknamed "F-Stop." A gang leader named Wade recently helped Virgil, hoping to recruit him, but Virgil is hesitant, as he knows his mother died in an exchange of gunfire between gangs. Wade eventually leads Virgil to a restricted area for a fight against F-Stop's crew, but it was interrupted by police helicopters. During the dispute with the police, chemical containers explode, releasing a gas that causes mutations among the people in the vicinity (this event was later known as "The Big Bang"). As a result, Virgil obtains the ability to create, generate, absorb, and control electricity and magnetism—he takes up the alter-ego of "Static". The gas also gives others in the area their own powers, and several of them become supervillains. The mutated people become meta-humans known as "Bang Babies", and their mutations apparently spread to other people around them. Virgil Ovid Hawkins/Static (Phil LaMarr) – A high school student in Dakota City. As a result of accidental exposure to an experimental mutagen in an event known as the Big Bang, he gained the ability to control and manipulate electromagnetism, and uses these powers to become a superhero named "Static." Countless others who were also exposed also gained a wide variety of mutations and abilities, and Static spends much of his time dealing with these "Bang Babies", many of whom use their abilities in selfish, harmful, and even criminal ways. Richard "Richie" Osgood Foley/Gear (Jason Marsden) – Virgil's best friend and confidant. At first, he merely provides support for his friend, making gadgets for him and helping to cover for Virgil to protect his secret identity. In the third season, it is revealed Richie's passive exposure to the Bang Gas gave him enhanced intelligence, which enabled him to easily invent rocket-powered boots and "Backpack", a highly intelligent multipurpose device worn on the back capable of surveillance and other semi-independent activity. With this equipment, he adopted the superhero identity "Gear" and becomes Static's full-time partner in crime-fighting. Robert Hawkins (Kevin Michael Richardson) – A social worker who runs the Freeman Community Center as head counselor. He is a widower and the single father of two teenagers—Virgil and Sharon. A strict but caring and genuinely understanding parent, he dislikes gangs and the destructive attitudes of most Bang Babies, and his work at the community center is motivated by a desire to counteract their bad influence on young people. Sharon Hawkins (Michele Morgan) – Virgil's older sister, Sharon attends college, but she still lives at home. She volunteers at a hospital, and counsels young people at the Freeman Community Center. While they do argue frequently, Sharon and Virgil really do care about each other and are quick to come to the other's defense if one of them is in danger. After their mother died, Sharon took it upon herself to act as the woman of the house, including when it comes to allocating chores between her and her brother, not least of all the cooking (which, at least according to Virgil, Sharon is not all that good at). Adam Evans/Rubber-Band Man (Kadeem Hardison) – A meta-human transmorph, whose body structure consists of shapeable rubber. He is the younger brother of Static's archenemy, Ebon. Rubber-Band Man first appears as a tragic villain when he goes after an opportunistic record producer who stole one of his songs. He subsequently breaks out of prison but decides not to pursue a criminal career, however. He and Sharon eventually start dating, with Sharon helping Adam turn over a new leaf. He and Virgil initially clash, but Virgil comes to accept Adam's relationship with his sister and they become allies in crime-fighting, with Adam even becoming like an older-brother figure to Virgil. Ivan Evans/Ebon (Gary Anthony Sturgis) – The head of a large group of Bang Babies called "The Meta-Breed" and the series' main antagonist. Ebon is an unusually powerful and strong meta-human. As a living shadow, he is able to create inter-dimensional portals and can manipulate pure darkness and shadows, as well as transport others to various locations of his choice. The series was produced by Warner Bros. Animation based on the Milestone Media/DC Comics character Static. Its supervising producer was Alan Burnett and Scott Jeralds was the main producer under the executive production of Jean MacCurdy and Sander Schwartz. The production team was mostly composed of people who were involved with Batman: The Animated Series and Superman: The Animated Series, but also included Static's co-creator Denys Cowan. Although the show hired the comic series' co-creator Dwayne McDuffie as story editor and writer, McDuffie had no direct involvement on the development of Static Shock. The idea of a Static cartoon first emerged with DC's editor-in-chief Jenette Kahn during the time McDuffie was working for Milestone under Kahn. In 1993, Kahn proposed to adapt some Milestone comics; Burnett was hired to write a pilot episode for an X-Men-esque series with Milestone superheroes called The New Guard. After attempts to produce several other Milestone projects, Static was eventually the series "they went for". By the time Milestone and DC drafted their contract over DC distributing Milestone comics, the characters were from separate fictional universes. However, when crossovers between Static Shock and other DC animated series were suggested, it was established that they were from the same DC animated universe—"rather than having to muck around with multiple dimensions, or whatever." Although McDuffie stressed that the show remains loyal to "the spirit and the tone" of the comic book, some changes were done because of its timeslot and target audience of pre-teens. [a] For example, guns appeared less frequently, Richie is not portrayed as homosexual, and he is Virgil's confidant instead of Frieda. Virgil is also younger in the animated series, his costumes and use of his powers are different than the original, and his mother is dead in the show despite the fact that she is alive in the comics. The latter change was done because producers had the intention "to focus on a strong, complex relationship between an African-American father and son." Nevertheless, McDuffie was concerned by the change because he originally intended to oppose the stereotype of black people not having a complete nuclear family. However, McDuffie said "that [it] worked out okay" as the crew could use the absence of Virgil's mother to create a "couple of great stories". Virgil's father, Robert, "for all intents and purposes, is a new character", as he was reconceptualized as a social worker. The same goes for Richie, who is described as an amalgam of different characters from the original comic. For the villains, Hotstreak was reused from the Static comics, Edwin Alva was brought from another Milestone's series—Hardware—, and the group Meta-Breed was created for the TV series. The third season marks Richie turning into superhero Gear. This was done partially because it was becoming hard to fit him into the story and the producers wanted to keep the "chemistry" between voice actors Phil LaMarr (right) and Jason Marsden. The third season of the show saw some of the biggest changes; in addition to Richie's superhero powers and a new opening, Static changed his costume. Cowan stated that the change was done to give his clothes a "feel of the comic book", while McDuffie said it represented a growth that Virgil was passing through. This maturation made possible to "explore some of the darker places in his world," to have more varied conflicts, as the villains have also become more mature. He described it is as "a natural outgrowth of all that, as is the new, more naturalistic look of the show." This change followed the second-season premiere—"The Big Leagues"—when Static meets Batman and Robin. Burnett said, "after that show, everybody went, 'Let's go in that direction.'" Writer John Semper, Jr. commented, "of course, I always lean toward the dramatic ... But the same old light-hearted Static spirit is still there." Richie gains superhero powers because it was becoming hard to fit him into the story and the producers wanted to keep the "chemistry" between voice actors LaMarr and Marsden. There was also a positive response from children in focus groups so "[t]he answer seemed pretty obvious." The series' music director was Richard Wolf, while he, Stanley Clarke and Max Gousse were the composers, and Kennard Ramsey was the orchestrator. For action sequences, Wolf wanted to use "real adrenaline-pumping beat" of 125 beats per minute; however, hip hop music usually only reached 110 beats. The predominant score was electronica with some hip hop-type and DMX-type vocals. R&B and classic hip hop melodies were also used depending on the scenes, and each character had a specific theme. Wolf composed the opening theme for the first two seasons. Starting from the third season, the show had a new opening theme, written by Master P and Lil' Romeo (and performed by the latter). Static Shock aired on the Kids' WB programming block of The WB from September 23, 2000, until May 22, 2004. The first African American superhero-centered television series, it ran a total of 52 episodes. Reruns of the series were shown on Cartoon Network, starting on December 2001, and on Disney XD on February 2009. The first six episodes were released to DVD on September 28, 2004, in a single volume entitled "The New Kid". The complete first season was made available for download on iTunes on July 4, 2011. In 2017, Warner Brothers started to release Static Shock's complete seasons on manufacture on demand DVDs as a part of the Warner Archive Collection. The first season was published on March 28; the second season on May 23; the third on January 30, 2018; and the fourth on April 13, 2018. Starting in September 2018, all episodes of the series have been made available on the DC Universe digital streaming service. Static Shock's episodes handle a variety of issues, including gangs, gun violence, homelessness, bullying, racism, mental illness, bigotry, and drugs. Other episodes also featured the subject of Chanukah and Christmas celebrations. The series was also marked by several crossover episodes with characters from the DC animated universe like Superman, Green Lantern, the Justice League, and the Batman Beyond cast. Several episodes also featured guest voice actors, including basketballers (like Shaquille O'Neal, Karl Malone, Yao Ming, Tracy McGrady and Steve Nash) and musicians, such as the B2K group, Lil' Romeo and the Backstreet Boys' A. J. McLean. Guest crew was also featured, including cartoonist Rick Hoberg as storyboard artist, and Paul Dini and John Ridley as writers. Static Shock was an extremely popular show, granting its new renewal for a second season just a month after its debut. As of December 2000, it was the highest-rated pre-teen—from 2 to 11 years—show among all networks on its timeslot, and the third best on the Kids' WB! lineup. From its debut to July 2003, the show secured the second post among boys aged 6 to 11 years. Ratings increased after Richie's character obtained superhero powers; McDuffie affirmed that this is what secured the renewal for a new season. Indeed, the show's third season was its most popular and was the second best-rated Saturday morning program among boys aged 6 to 11 years, and tweens and male tweens aged 9 to 14. From February to April 2003, ratings regularly performed over the 4.0 stake among the public aged 9 to 14 years; it even reached the 6.4 mark in May. Static Shock's last season was only surpassed by the children's anime Pokémon, and the show's reruns on Cartoon Network were only surpassed by the adult animated sitcom Family Guy. Static Shock was the only program on Cartoon Network to be among the top 30 most watched kids shows in a week of October 2004. It was also the best rated program of the channel among kids on a week of January 2005, and the best rated show on Cartoon Network's Miguzi block as of March 2005. For the 2004–05 season, it was the 18th most watched Saturday morning children's show of all networks. Static Shock was ultimately cancelled due to the low production of associated merchandising products. Static Shock's episode "The Big Leagues" earned director Dave Chlystek a nomination for Outstanding Achievement for Directing in an Animated Television Production at the 2002 Annie Awards. This episode was also nominated for a Golden Reel Award for Best Sound Editing in Television Animation in 2003. That same year, for the episode "Jimmy", McDuffie and Burnett were awarded the Humanitas Prize in the Children's Animation Category in 2003. At the 30th Daytime Emmy Awards in 2003, the show was nominated for Special Class Animated Program and Richard Wolf was nominated for Achievement in Music Direction and Composition. At the 31st Daytime Emmy Awards in 2004, both the animated series and Wolf were again nominated for the same categories—this time, Wolf won the award. Although noted Static Shock did not feature the very first African-American superhero, Andy Mangels affirmed it was the first to have a diverse roster of characters and cast members as well. 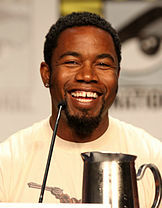 For example, Michael Jai White (left) portrays Osebo in the episode "Static in Africa", while Alfre Woodard appears as Virgil's mother in "Flashback". Leonard Pierce of The A.V. Club described it as "a surprising and sometimes rewarding success". October 2001 issue of Wizard listed the 100 best cartoon shows ever as selected by their readers, with Static Shock ranked at number 88. Jonathon Dornbush, in a 2014 Entertainment Weekly article, included it among the nine best comics-based animated TV series. He asserted, "Static Shock didn't have quite the name recognition of its DC brethren when it debuted, but the show proved it could stand alongside the greats." Charlie Jane Anders, for io9, ranked it 91st on a list of the best science fiction and fantasy shows; she commented, "amidst a glut of superhero cartoons, this is one of the most memorable." In The Superhero Book, Andy Mangels praised Static Shock's multicultural approach, while Emily Ashby from Common Sense Media lauded it for encouraging diversity. Mangels declared that "Static Shock provides solid superheroic entertainment and a role model and promotion of diversity for not only African-American viewers, but for audiences of all colors and ages." Writing for Entertainment Weekly, Monique Jones praised the series for a positive depiction not only of an African American superhero but of an African country—Ghana. Jones also commended how the series incorporated social issues in "an easily digestible" way without having to "sugarcoat" them. Lynne Heffley of Los Angeles Times commented it "isn't your typical Saturday-morning cartoon series", praising its themes and electing the episode "Jimmy"—about gun violence—as an example. Evan Levine, writing for Rome News-Tribune, asserted that "the series is at its best when it confronts issue actually facing kids." Jones commended Virgil's portrayal as an everyman teenager, while Ashby appreciated Virgil's "relatable" character. Colby Lanham of Comic Book Resources said Virgil "was perhaps the most human of many superheroes on television at the time" and considered the series was canceled too soon. Ashby was also positive to the fact that Virgil usually counted on dialogues before going into action; this action was also praised by John Sinnott of DVD Talk, who said it is "something that most animated heroes never think to do." Ashby also applauded Virgil's "surprising depth of character" to not follow a gang but to use his powers for good. While Levine praised "its bright, cartoony visuals [that] are a notch above those of many other animated series," Sinnott considered some of the animation to be "a little stilted." Sinnott called it "a fun series overall", but considered some jokes to be "a little stale". Neil Dorsett of DVD Verdict was generally disappointed; he called voice acting "very standard", and said that "artwork and animation are also both behind the times". Dorsett also criticized Virgil's one-lines, which "invites, like many other elements of the series, comparison to Spider-Man." He, however, pondered that his opinion may come from a bad first impression: "Although there are lots of things to nitpick about the show, there's not really anything wrong with it." Both Sinnott and Dorsett compared it unfavorably to the original comic book. Entertainment Weekly's Ken Tucker questioned why The WB made a TV show based on a cancelled, poorly-sold comic and criticized the "uttering tired, condescending lines" professed by Virgil. Nancy Imperiale Wellons from the Orlando Sentinel said "Virgil has a believable relationship with his family -- including a strong father figure -- but the show's pacing lags." Paul Schultz wrote for the New York Daily News that "Many of the characters -- the conservative, the annoying sister -- are cliches." Thelma Adams criticized the show in the New York Post; first she called it "formulaic but appealing" and ultimately dubbed it "lame". Static Shock led its characters to be incoporated in the DC animated universe. In the picture, a future Static appears in a Justice League Unlimited episode aired half a year after the ending of Static Shock. The show's popularity led to new demand for Milestone's Static comics: the first four issues of it were reissued as Static Shock: Trial by Fire in 2000 and a miniseries, Static Shock! : Rebirth of the Cool, was released between January and September 2001. In May 2003, Midway Games announced the production of a platformer video game based on the show for the Game Boy Advance. Although it was displayed at the Electronic Entertainment Expo, the game was later cancelled. For a period starting on July 4, 2004, Subway Restaurants released a series of toys based on the TV series to be offered in the United States and Canada. On September 1, 2004, Scholastic Corporation published two tie-in children's books written by Tracey West. McDuffie's work on Static Shock placed him in the circles of animated series, and he became a writer and producer for shows like Justice League, Teen Titans, Justice League Unlimited, and Ben 10: Alien Force. McDuffie was responsible for diversifying the DC animated universe's Justice League by including black and female characters. Moreover, Arie Kaplan credits McDuffie and his co-writers for giving "a depth and complexity" the group was lacking since the 1970s. A future, older version of Virgil appeared in the Justice League Unlimited episode "The Once and Future Thing, Part 2: Time, Warped" in January 2005. ^ Leonard Pierce of the A.V. Club even considered it to be "the most kid-oriented of all the [DC animated universe] franchise's shows," and "much more appealing to a younger audience than Batman, Superman, or Justice League", for example. ^ a b c d "Static Shock (2000 – 2004)". DC Comics. Archived from the original on February 23, 2015. Retrieved July 17, 2015. ^ a b "All-New "Pokemon GS," Plus New Series "Jackie Chan Adventures," "X-Men Evolution" And "Static Shock!" Highlight New Saturday Morning Schedule For Ratings King Kids' WB!". Warner Bros. April 4, 2000. Archived from the original on October 16, 2015. Retrieved June 28, 2015. ^ a b McClintock, Pamela; Oei, Lily (March 4, 2004). "Ellen the talk of Emmys". Variety. Penske Business Media. Archived from the original on October 16, 2015. Retrieved June 28, 2015. ^ a b c d e f g h i j k l m n Misiroglu, Gina Renée; Roach, David A. (2004). The Superhero Book: The Ultimate Encyclopedia of Comic-book Icons and Hollywood Heroes. Visible Ink Press. pp. 471–472. ISBN 9781578591541. ^ a b c d e f g h i j k l m n o p q r Harvey, Jim. "Backstage - Interviews - Dwayne McDuffie". The World's Finest. Archived from the original on February 11, 2015. Retrieved June 28, 2015. ^ a b c Meyeres, Randy (October 20, 2001). "Dwayne McDuffie: 'Static Shock,' breaking into comics, and guys with bras on their heads". CaptainComics.net. Archived from the original on April 13, 2001. Retrieved August 2, 2015. ^ Roberts, Paul Dale (c. 2001). "Interview with Dwayne McDuffie". Jazma Universe Online. Archived from the original on March 6, 2002. Retrieved August 3, 2015. ^ a b c d e Ashby, Emily. "Static Shock TV Review". Common Sense Media. Archived from the original on April 26, 2010. Retrieved June 28, 2015. ^ a b c d Pierce, Leonard (November 18, 2010). "The DC Animated Universe". The A.V. Club. The Onion. Archived from the original on September 5, 2015. Retrieved June 29, 2015. ^ Vaughn, J.C. (September 29, 2000). "Static in Shocking Comeback". FanUniverse. Archived from the original on December 16, 2000. Retrieved August 3, 2015. ^ "Rebirth of Milestone: interview with Denys Cowan & Dwayne McDuffie". Pop Culture Shock. July 2000. Archived from the original on July 28, 2001. Retrieved August 3, 2015. ^ a b c d e Campbell, Ramsey (December 25, 2000). "Tv Superhero Reflects Real Life". Orlando Sentinel. Tribune Publishing. Archived from the original on September 11, 2015. Retrieved June 28, 2015. ^ a b c d Allstetter, Rob (September 22, 2000). "Simmons Talks Static Shock". The Comics Continuum. Archived from the original on April 4, 2003. Retrieved July 13, 2015. ^ a b ""Static Shock" And Kids' WB! Energize Saturday Mornings With All-New Adventures, Costume And Super Hero Sidekick, Beginning January 25". Waner Bros. January 8, 2003. Archived from the original on July 20, 2015. Retrieved July 17, 2015. ^ Allstetter, Rob (September 7, 2002). "Static Shock's new look". The Comics Continuum. Archived from the original on February 19, 2005. Retrieved August 2, 2015. ^ a b Harvey, Jim (January 24, 2003). "Static Shock: Interview with Dwayne". Dwayne McDuffie blog. Archived from the original on October 16, 2015. Retrieved July 17, 2015. ^ a b Allstetter, Rob (January 14, 2003). "Alan Burnett talks Static Shock". The Comics Continuum. Archived from the original on June 18, 2007. Retrieved August 2, 2015. ^ Harvey, Jim (January 22, 2003). "Static Shock Story Editor Speaks". Dwayne McDuffie blog. Archived from the original on July 23, 2015. Retrieved July 17, 2015. ^ a b "The National Television Academy Announces 30th Annual Daytime Emmy Award Nominations in a Special Broadcast on ABC's "The View"" (PDF). emmyonline.org. National Television Academy. Archived (PDF) from the original on October 21, 2013. Retrieved June 28, 2015. ^ "Static Shock". Performing Arts Encyclopedia. Library of Congress. Archived from the original on April 5, 2016. Retrieved June 19, 2016. ^ Farinella, David John (January 1, 2002). "Composer Spotlight: Richard Wolf". Mix. Archived from the original on July 20, 2015. Retrieved July 17, 2015. ^ "Cast and Crew". The World's Finest. Archived from the original on February 24, 2015. Retrieved July 17, 2015. ^ Allstetter, Rob (January 9, 2003). "Static Shock's third season". The Comics Continuum. Archived from the original on December 29, 2005. Retrieved July 17, 2015. ^ a b "Catwoman Movie Update". The Comics Continuum. May 10, 2004. Archived from the original on July 25, 2015. Retrieved July 24, 2015. ^ a b "Kids' WB! Air Date Schedule for Week #38". The Comics Continuum. Archived from the original on July 25, 2015. Retrieved July 24, 2015. ^ "'Pokemon' on 'Toon". Variety. Penske Business Media. October 30, 2001. Archived from the original on October 16, 2015. Retrieved June 28, 2015. ^ Allstetter, Rob (January 24, 2009). "Coming Sunday". The Comics Continuum. Archived from the original on February 16, 2009. Retrieved July 13, 2015. ^ a b c d e Sinnott, John (November 10, 2004). "Static Shock, Volume 1 - The New Kid". DVD Talk. Internet Brands. Archived from the original on January 14, 2015. Retrieved June 28, 2015. ^ a b c d e Dorsett, Neil (January 5, 2005). "Static Shock: The New Kid". DVD Verdict. Archived from the original on September 5, 2015. Retrieved June 28, 2015. ^ "Static Shock, Season 1". iTunes. Archived from the original on July 3, 2015. Retrieved June 28, 2015. ^ Johnston, Rich (February 28, 2017). "Complete Static Shock First Series To Be Released On DVD By Warners". Bleeding Cool. Archived from the original on February 28, 2017. Retrieved January 10, 2018. ^ Kelley, Shamus (April 20, 2017). "Static Shock Season 2 Coming to DVD". Den of Geek. Archived from the original on November 9, 2017. Retrieved January 10, 2018. ^ "Static Shock: The Complete First Season". Amazon.com. Retrieved January 10, 2018. ^ "Static Shock: The Complete Second Season". Amazon.com. Retrieved January 10, 2018. ^ "Static Shock: The Complete Third Season". Amazon.com. Retrieved January 10, 2018. ^ "Static Shock: The Complete Fourth Season". Amazon.com. Retrieved March 25, 2018. ^ "Static Shock: The Complete Fourth Season ( (DVD))". Walmart. Retrieved March 30, 2018. ^ Lu, Alexander (July 28, 2018). "SDCC '18: We Went Hands On With the DC Universe App and Here's What You'll Get". Comics Beat. Retrieved August 1, 2018. ^ a b Heffley, Lynne (May 3, 2002). "Cartoon Superhero Gets Serious". Los Angeles Times. Tribune Publishing. Archived from the original on September 13, 2015. Retrieved June 29, 2015. ^ Harvey, James (February 22, 2002). "Creators Talk Static Shock's "Frozen Out"". Toon Zone. Archived from the original on July 22, 2015. Retrieved July 17, 2015. ^ Ball, Ryan (February 20, 2004). "Basketball All-Stars Get Static Shock". Animation Magazine. Archived from the original on September 11, 2015. Retrieved July 17, 2015. ^ Allstetter, Rob (January 23, 2004). "Static Shock update". The Comics Continuum. Archived from the original on July 22, 2015. Retrieved July 17, 2015. ^ Allstetter, Rob (November 3, 2003). "Static Shock Update". The Comics Continuum. Archived from the original on May 4, 2009. Retrieved August 2, 2015. ^ Smith, Zack (February 25, 2014). "12 Years a Slave Screenwriter John Ridley Talks History, Writing, Comics". Newsarama. Purch. Archived from the original on May 10, 2015. Retrieved August 2, 2015. ^ Bernstein, Paula (December 6, 2000). "Kids' WB! reups 'Static'". Variety. Penske Business Media. Archived from the original on October 16, 2015. Retrieved August 2, 2015. ^ Oei, Lily (July 2, 2003). "WB orders 'Shock' block". Variety. Penske Business Media. Archived from the original on July 22, 2015. Retrieved July 17, 2015. ^ "Kids' WB! Announces 2003-2004 Schedule As Network Reinforces "Year-Round" Programming Strategy". Warner Bros. February 25, 2003. Archived from the original on July 21, 2015. Retrieved July 17, 2015. ^ Fitzgerald, Toni (February 28, 2003). "Grammys' real appeal among young". Media Life Magazine. Archived from the original on October 16, 2015. Retrieved June 29, 2015. Fitzgerald, Toni (March 21, 2003). "'SpongeBob,' make room for 'Fear Factor'". Media Life Magazine. Archived from the original on October 8, 2013. Retrieved June 29, 2015. Fitzgerald, Toni (April 4, 2003). "Much of why 'Wanda's' hot". Media Life Magazine. Archived from the original on October 16, 2015. Retrieved June 29, 2015. Fitzgerald, Toni (April 14, 2003). "'Dragonball Z,' older kid on the block". Media Life Magazine. Archived from the original on October 16, 2015. Retrieved June 29, 2015. Fitzgerald, Toni (April 25, 2003). "Enduring story of 'The Ten Commandments'". Media Life Magazine. Archived from the original on October 16, 2015. Retrieved June 29, 2015. ^ Fitzgerald, Toni (May 9, 2003). "'Dawson's Creek,' we will miss thee". Media Life Magazine. Archived from the original on October 16, 2015. Retrieved June 29, 2015. ^ Vasquez, Diego (November 5, 2004). "'Rudolph,' that legacy of Christmas TV". Media Life Magazine. Archived from the original on October 16, 2015. Retrieved June 29, 2015. ^ Vasquez, Diego (January 28, 2005). "How sweet it is, 'My Super Sweet 16'". Media Life Magazine. Archived from the original on October 16, 2015. Retrieved June 29, 2015. ^ "Kids 6-11 Kids' Total Day Ratings, Delivery Climb 40% in 10th Straight Week of Solid Growth at Cartoon Network". Cartoon Network. March 8, 2005. Archived from the original on October 16, 2015. Retrieved June 29, 2015 – via The Futon Critic. ^ "Marking a Decade at the Top". PR Newswire. June 28, 2005. Archived from the original on July 1, 2015. ^ Godfrey, Leigh (January 6, 2003). "2002 Annie Award Nominees". Animation World Network. Archived from the original on September 19, 2015. Retrieved June 28, 2015. ^ Martin, Denise (February 7, 2003). "'Gangs,' 'Perdition' top Golden Reel nods". Variety. Penske Business Media. Archived from the original on October 16, 2015. Retrieved June 28, 2015. ^ Nason, Pat (July 11, 2003). "'Antwone Fisher' wins top Humanitas Prize". United Press International. Archived from the original on January 1, 2015. Retrieved July 12, 2015. ^ Gil, Billy (July 10, 2003). "Fisher nets Humanitas". Variety. Penske Business Media. Archived from the original on October 16, 2015. Retrieved July 12, 2015. ^ Morfoot, Adie (May 16, 2004). "'Sesame,' 'Ellen' top Creative Emmys". Variety. Penske Business Media. Archived from the original on October 16, 2015. Retrieved June 28, 2015. ^ Allstetter, Rob (December 9, 2002). "Static Shock Update". The Comics Continuum. Archived from the original on November 19, 2008. Retrieved August 2, 2015. ^ Weitzman, Alex (March 9, 2011). "Toonzone Presents: An Interview/Tribute to Dwayne McDuffie". Toon Zone. Archived from the original on October 16, 2015. Retrieved August 2, 2015. ^ "100 Greatest Toons Ever". Wizard (121). October 2001. ^ Dornbussh, Jonathon; Rivera, Joshua (October 1, 2014). "9 Best Animated TV Series Drawn from Comics". Entertainment Weekly. Time Inc. Archived from the original on September 22, 2015. Retrieved June 29, 2015. ^ Anders, Charlie Jane (August 27, 2009). "The Top 100 Science Fiction/Fantasy Shows: #91 Through 100". io9. Archived from the original on July 21, 2015. Retrieved July 17, 2015. ^ a b c Jones, Monique (November 8, 2014). "New 'Static Shock': 3 lessons to learn from DC's classic animated series". Entertainment Weekly. Time Inc. Archived from the original on January 14, 2015. Retrieved June 29, 2015. ^ a b Levine, Evan (February 19, 2002). "Kids' TV: Superpowers and superheroes". Rome News-Tribune. News Publishing Company. Retrieved July 17, 2015. ^ Lanham, Colby (September 17, 2016). "10 Animated Superhero Shows Canceled Too Soon". Comic Book Resources. Valnet Inc. Archived from the original on October 30, 2016. Retrieved October 30, 2016. ^ Tucker, Ken (January 26, 2001). "TV Show Reviews: 'Bob The Builder'; 'Disney's House Of Mouse'; 'Jackie Chan Adventures'; 'Static Shock'; 'X-Men: Evolution'". Entertainment Weekly. Time Inc. Archived from the original on July 5, 2015. Retrieved June 29, 2015. ^ Wellons, Nancy Imperiale (September 30, 2000). "Children's Shows You Might Want To See -- And Some Others". Orlando Sentinel. Tribune Publishing. Archived from the original on September 10, 2015. Retrieved June 29, 2015. ^ Schultz, Paul (October 15, 2000). "Superheroes for a Changing World". New York Daily News. Archived from the original on October 16, 2015. Retrieved June 29, 2015. ^ Adams, Thelma (September 29, 2000). "They Know What Boys Like..." New York Post. News Corp. Archived from the original on September 19, 2015. Retrieved June 29, 2015. ^ a b Sava, Oliver (September 16, 2013). "Justice League: "The Once and Future Thing, Parts 1 & 2: Weird Western Tales and Time, Warped"". The A.V. Club. The Onion. Archived from the original on September 24, 2015. Retrieved June 29, 2015. ^ "Issue :: Static Shock: Trial By Fire". Grand Comics Database. Archived from the original on September 19, 2015. Retrieved June 28, 2015. ^ "Covers :: Static Shock! : Rebirth of the Cool". Grand Comics Database. Archived from the original on February 16, 2012. Retrieved June 28, 2015. ^ Harris, Craig (May 9, 2003). "E3 2003: First Look Static Shock". IGN. Ziff Davis Media. Archived from the original on October 16, 2013. Retrieved June 28, 2015. ^ a b "E3 2003: Hands-On: Static Shock". IGN. Ziff Davis Media. May 14, 2003. Archived from the original on October 15, 2013. Retrieved June 28, 2015. ^ "Static Shock for Game Boy Advance". GameRankings. CBS Interactive. Archived from the original on September 10, 2015. Retrieved June 28, 2015. ^ Playthings staff (June 24, 2004). "Static Shock in Subway promo". Gifts & Decorative Accessories. Progressive Business Media. Archived from the original on October 16, 2015. Retrieved June 28, 2015. ^ "Static Shock Chapter Book #1". Amazon.com. Archived from the original on October 16, 2015. Retrieved June 28, 2015. ^ "Soul Power! (Static Shock Chapter Book, No. 2)". Amazon.com. Archived from the original on October 16, 2015. Retrieved June 28, 2015. ^ a b Fox, Margalit (February 24, 2011). "Dwayne McDuffie, Comic-Book Writer, Dies at 49". The New York Times. Archived from the original on June 11, 2015. Retrieved June 28, 2015. ^ a b c Kaplan, Arie (2006). Masters of the Comic Book Universe Revealed!. Chicago Review Press. p. 213. ISBN 9781556526336.